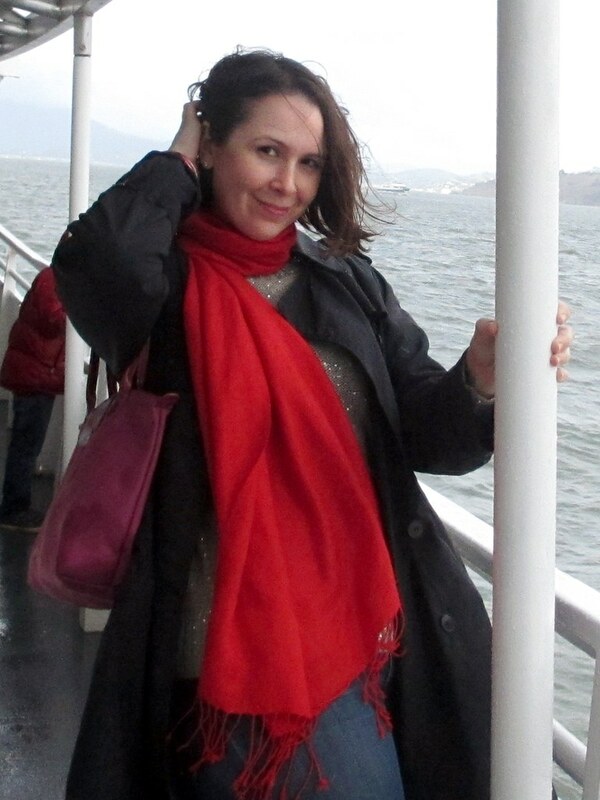 When my friend Lisa visited, I took Monday off and we headed out with Pat (my husband) to Alcatraz. Pat’s from the Bay area, and we’d been coming back to visit his family for years before we moved here — but somehow we never made it out to that prison island. We were like those New Yorkers who never visit the Statue of Liberty. Sometimes you need a friend to visit in order to get around to the touristy stuff! The day started pretty miserably — chilly and rainy — but around here, you never know what the weather will bring. So like a good San Franciscan, I dressed in layers: a trenchcoat, sweater (not just any old sweater though – a sparkly one! ), and cami underneath, with a scarf that could double as a shawl. And I even wore jeans — a rare occurrence! Oh yes, and I accessorized with bangles – I really love the red and pink combo. I knew we’d be walking around all day, but I also knew we’d be taking tons of photos. It is possible to be comfortable and still look good! And guess what? 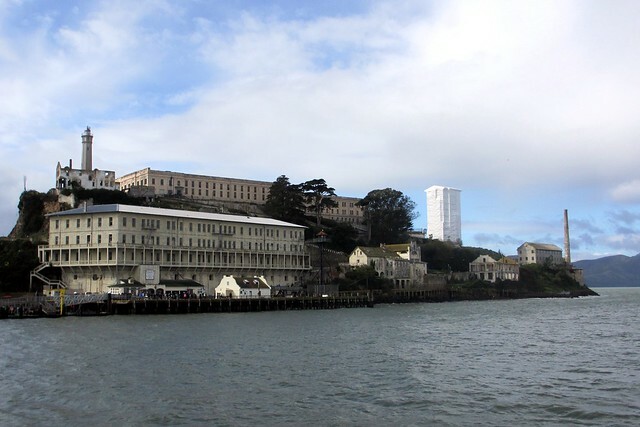 By the time we reached Alcatraz, the sun had come out. That’s San Francisco weather! Alcatraz - view from the ferry. Alcatraz - storage door. And boy. 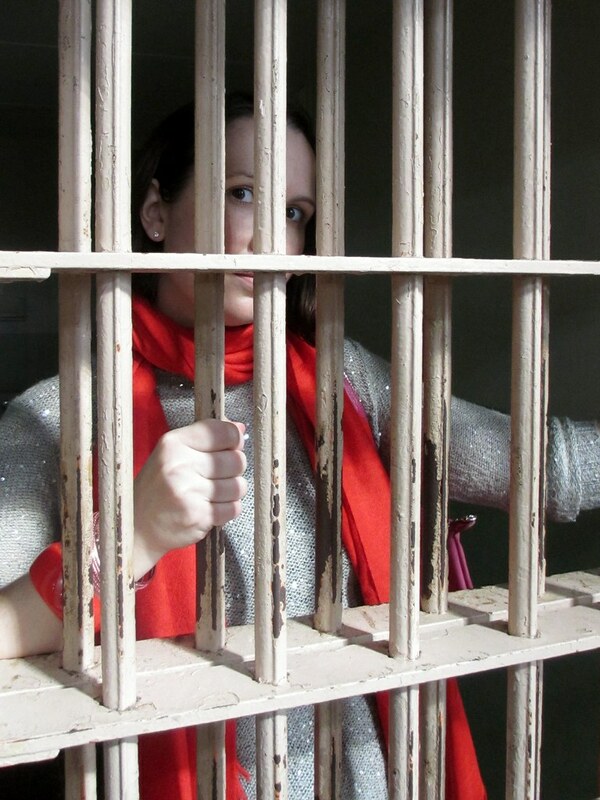 I briefly ended up behind bars . . . Behind bars. Photo by Pat. Prison chic? 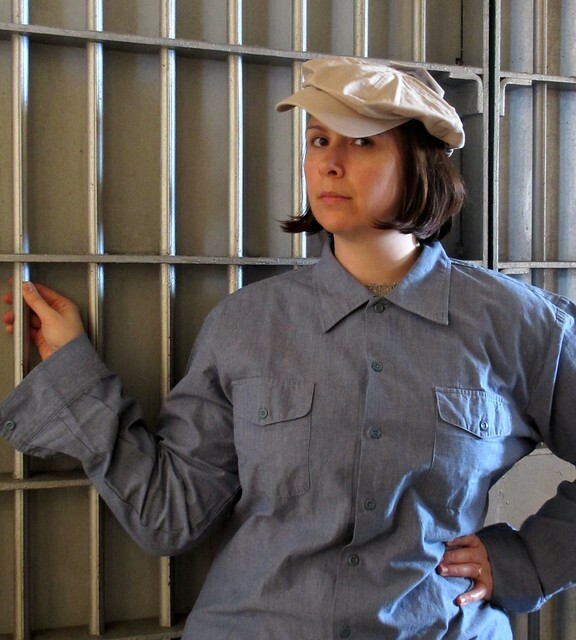 Modeling Alcatraz prison wear replicas. Photo by Pat.
. . . but finally managed to escape outside with Lisa! 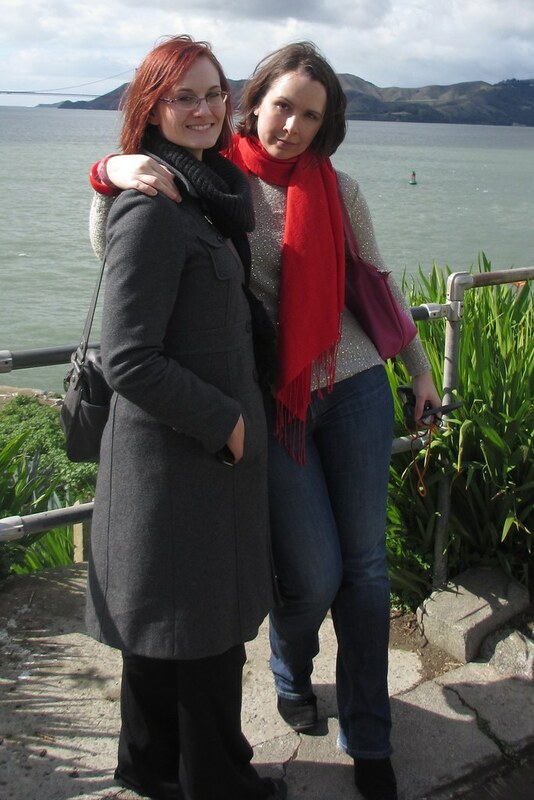 With Lisa at Alcatraz. Photo by Pat. By the time we were ready to head home, rain clouds had started to gather again. Luckily, we made it to the ferry just as the rain hit! 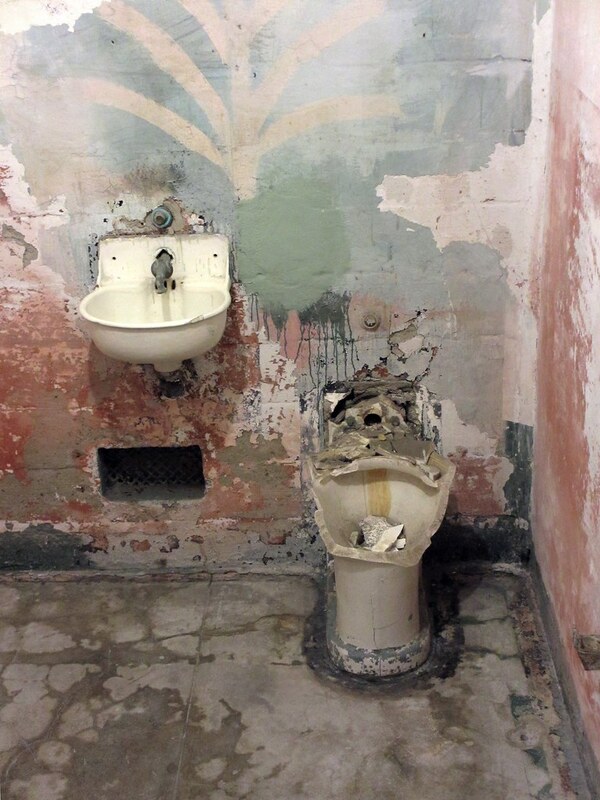 I highly recommend visiting Alcatraz — especially if you love to take pictures. Just make sure you wear layers, a raincoat, and bring an umbrella. 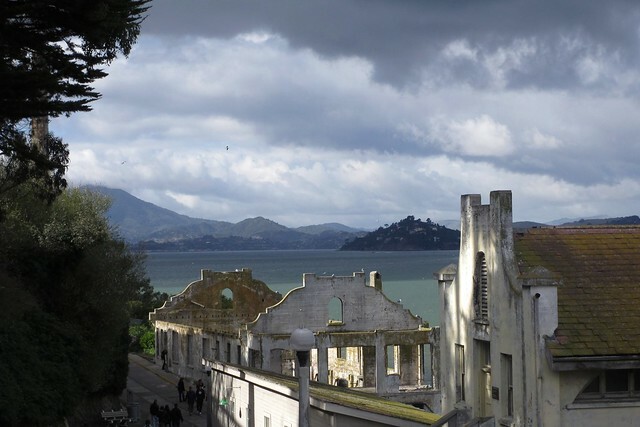 I saw lots of tourists stuck with Alcatraz ponchos! Oh, I have to tell you, that sparkly top is SO cute! Wow, that sounds really cool – but I can imagine might freak some people out (probably myself included!)! Hope you enjoy your trip out here! San Francisco stays pretty cool all year ’round, so definitely bring layers. Outside the city it can get hot! Sounds like a fun day trip to me! Then again, one of the reasons I went to London was to go to Whitechapel (Jack the Ripper territory). 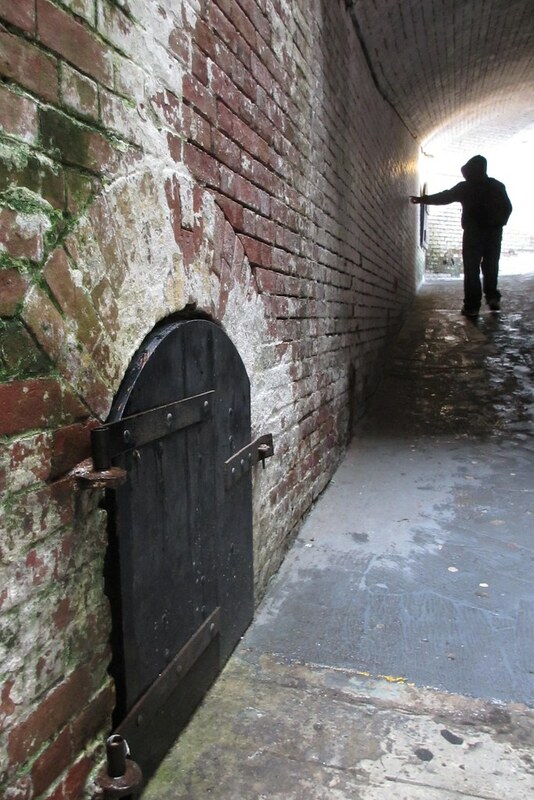 Have to say, the thought of Jack the Ripper makes my skin crawl! What kind of tours/stuff do they do in Whitechapel? 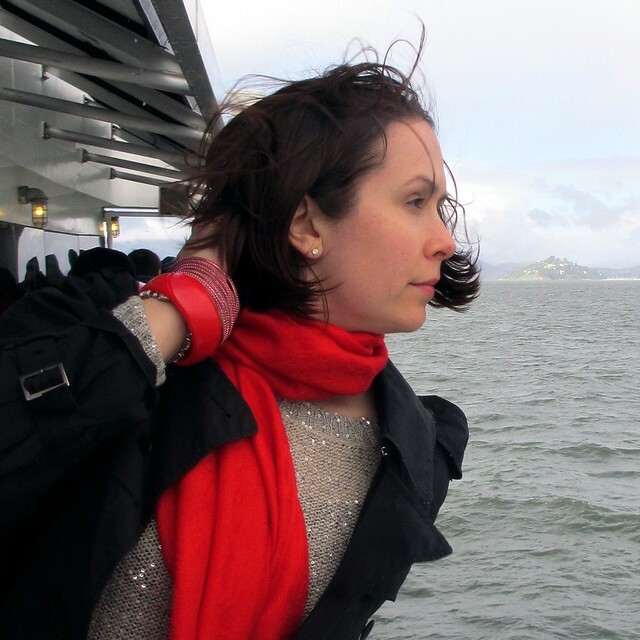 I really wanted to visit there the last time I was in San Francisco but never made it – great photos (and love the sparkly sweater)!